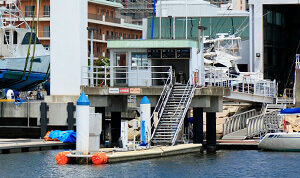 View the berthing price and facilities below. 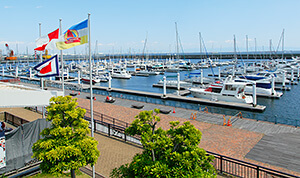 Shin Nishinomiya Yacht Harbor is a sophisticated marina located in Nishinomiya, Hyogo Prefecture. Our marina is known as the port from which Mr. Kenichi Horie departed for his voyage across the Pacific Ocean in 1962. He is Japan’s most famous yachtsman, and the first man in history to make a non-stop solo crossing of the Pacific Ocean. Nishinomiya is famous for having both beautiful nature and excellent accessibility to Osaka and Kobe. Therefore our marina is an ideal cruising destination or stopover for one-day cruising to places such as Awajishima Island, Kii Channel and Naruto Channel. These locations are paradise for boat and yacht fans, those who enjoy cruising, sightseeing and fishing. Once at our marina, it is only a 30-minute-drive to Osaka and Kobe city. Major hotels, golf courses, a theme park (USJ) and shopping centers (NI-SHINOMIYA GARDENS and LaLaport KOSHIEN) are just a short drive away. 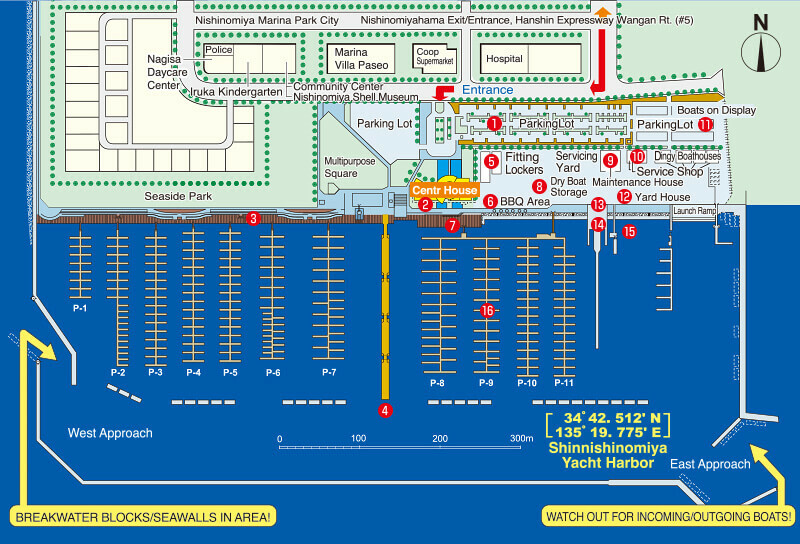 Soon after arriving at the harbor, please come to the reception desk at center house (highlighted with yellow on the map) for inward clearance procedures. Note that the full fee must be paid in advance. For visitors the maximum mooring period is 7 days. Cash and credit may be used for payment. The listed prices include taxes and may be changed. Please feel free to contact us about the details. We offer a lineup of high-octane gasoline, light oil and outboard motor oil for your boating needs. Fueling two ships simultaneously at the 20-meter berthing area is available from 9.30am to 5 pm. 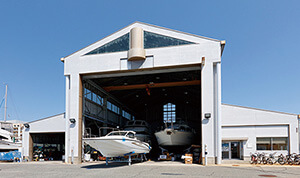 Our maintenance yard may be used for maintaining your boats in peak condition out of the water. 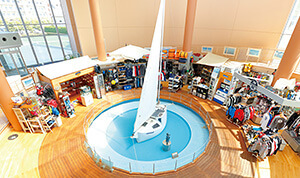 The capacity of the maintenance house is 3 boats (space for one 15-meter boat and two 9-meter boats). The maintenance yard for 10 boats is available outside of the house. Closed on Tuesdays. View details on our calendar here. 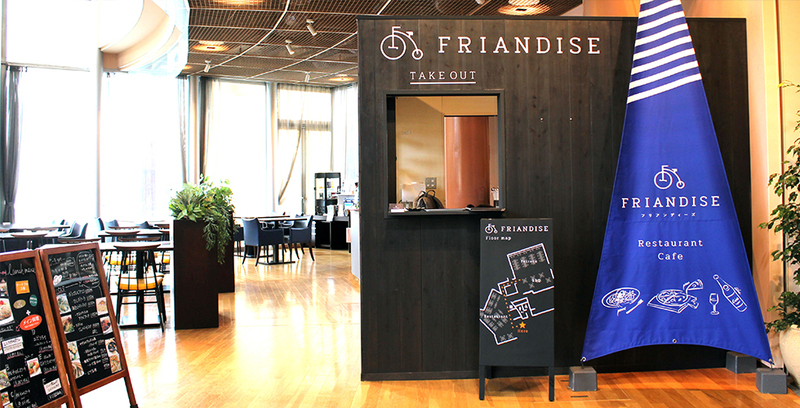 Situated on the first floor of the center house with gorgeous views of the Marina is our popular Italian restaurant, Friandise. Our specialty is a lunch course in which you can choose your main dish from five options. Last food order is at 7:30pm. Located on the third floor with wonderful views overlooking the Marina is a lovely café, Buono. A great place to watch a beautiful sunset while enjoying cocktails. Lightly sweetened cakes served with a wide variety of drinks are very popular. Copyright (C) 2017 Shin Nishinomiya Yacht harbor. All Rights Reserved.